Contemporary guidelines suggest using multimodal analgesia to provide quality analgesia, with fewer side effects for postoperative pain management targeted at reducing opioid requirements, optimizing analgesia, and shortening the hospital stay. Although surgical site-specific peripheral regional analgesic techniques have not been proven to improve long-term morbidity, they do provide immediate postoperative pain control. They can often reduce postoperative neurological, pulmonary, cardiac, and endocrine complications. Very recently, Forero et al. 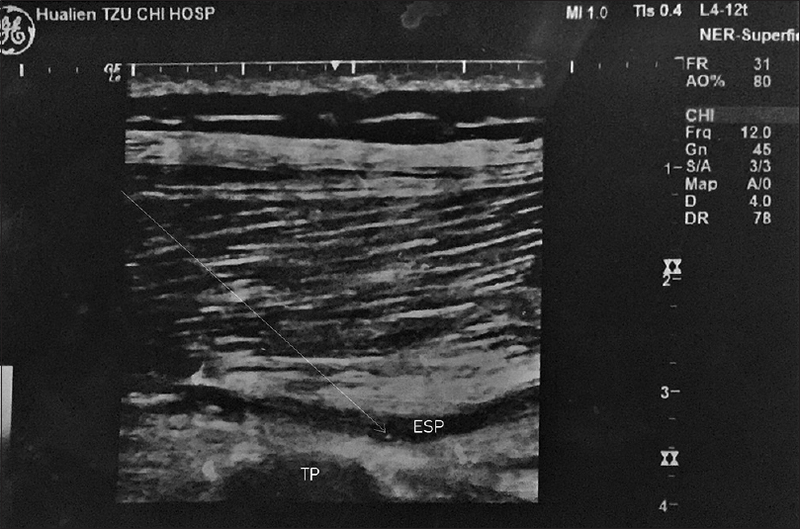 developed a novel ultrasound-guided regional block technique, the erector spinae plane (ESP) block, for chronic pain management on the trunk. There are no comparative studies that demonstrate if ESP is better than other blocks. Due to its simple nature, this regional analgesic technique has been advocated in many case series for the management of acute postoperative pain on the trunk,. Clinical and roentgenological studies suggest that the ESP block is able to block the ventral ramus and provides a somatic analgesic effect. To the best of our knowledge, most published data suggest using 20 mL, 25 mL, or higher volumes of local anesthetics for unilateral ESP block. The use of variable local anesthetic doses, often at the upper dose limit, however, leaves question marks regarding the consistency and safety of the ESP block. Interestingly, Restrepo-Garces et al. noted that the extent and intensity of analgesia were maintained with a continuous infusion regimen of dilute local anesthetic at only 6 mL/h with bilateral ESP when combined with patient-controlled analgesia with morphine. The infusion rate was similar to that which we ordinarily prescribed for epidural blocks. An epidural block provides a segmental block with a small dose. In this case, we attempted to examine the effectiveness of bilateral ESP blocks using a small volume (10 mL) of local anesthetic in the prevention or treatment of pain after single-port laparoscopic cholecystectomy. A 41-year-old female had a single-port laparoscopic cholecystectomy. She was a hepatitis B carrier with hypertension and hyperlipidemia. She was allergic to some nonsteroidal anti-inflammatory drugs. General anesthesia was induced with propofol 150 mg, fentanyl 100 μg, and rocuronium 50 mg and maintained with target-controlled intravenous propofol at 72 μg/kg/min. Dexamethasone 4 mg and ondansetron 4 mg were given intraoperatively to prevent or attenuate postoperative nausea and vomiting. Her hemodynamics was stable throughout the 2-h surgery. Before emergence from anesthesia, she was given bilateral transverse abdominis plane (TAP) blocks with 0.4% ropivacaine 20 mL under ultrasound guidance. She was extubated and transferred to the postanesthesia care unit (PACU) for further care. In the PACU, however, she started to complain of periumbilical surgical wound pain with a visual analog scale (VAS) score of 8/10. Intravenous fentanyl 50 μg was given in two divided doses; however, the VAS score only dropped to 7. An ESP block was considered and explained to the patient as a rescue analgesic modality. She was asked to turn to the left lateral decubitus position. Under ultrasound guidance, bilateral ESP blocks at the level of the T10 transverse process were performed [Figure 1]. To avoid systemic toxicity from bupivacaine, a mixture of 0.25% bupivacaine 10 mL and 1:200,000 epinephrine was administered. The wound pain diminished and was rated 2/10 ten minutes after the ESP block. Sensory blocks from the T7 to T12 dermatomes were demonstrated by pinprick. In the ward, she received additional oral acetaminophen 500 mg every 6 h for postoperative pain management. She rated her pain 1–2/10 on the VAS during the remaining 24-h observation time, except during an episode of sneezing, when she rated the pain 5/10 and rescue morphine 5 mg was administered intravenously. In this case, we demonstrated that bilateral ESP at T10 near the dermatome of the incisional wound from a single-port laparoscopic cholecystectomy provided effective analgesia with no noticeable side effects. This important finding means it can be applied to sensitive patients, such as the elderly. The use of small doses of local anesthetics avoids possible toxic effects due to systemic absorption. Similar to epidurals, ESP blocks provide a unilateral segmental block as was demonstrated in our case and others. They are unlike epidural blocks, which often cause sympatholytic effects and hypotension, and are contraindicated in patients with coagulation problems. Adhikary et al. provided evidence of the efficacy and safety of ESP in patients requiring heparin treatment postthoracotomy. Still, there are no comparative or controlled studies on ESP block with epidural or other peripheral nerve blocks for any surgeries on the trunk. Further study is needed to clarify their pros and cons. More recently, Tulgara et al. used ESP for postoperative analgesia in laparoscopic cholecystectomy in a randomized controlled study. However, they used 20 ml 0.375% bupivacaine for ESP block and did not report what kinds of laparoscopic surgeries (single port or traditional three ports) the patients received. A TAP block anesthetizes the anterior rami of spinal nerves T7–L1 which innervate the anterolateral abdominal wall. A systematic review and meta-analysis suggest its use for analgesia in laparoscopic cholecystectomy. However, Stoving et al. found that the distribution of a TAP block was nondermatomal and did not cross the midline. Therefore, it is unlikely to provide complete analgesia for midline and upper abdominal incisions. Single-port laparoscopic surgery requires a 3–5 cm vertical or horizontal incision to facilitate operation of the instruments and removal of excised tissue. Again, optimal analgesia for a midline incision requires a bilateral block with a higher volume (20 mL) of anesthetics. In addition, the effects of postoperative rectus abdominis sheath block might be attenuated due to drug leakage from the incision wound. The lack of meaningful benefits of TAP blocks serves as a lesson to incorporate new regional anesthetic techniques with caution; only time will tell if the ESP block can fulfill its true potential. The erector spinae is a bundle of muscles lying on the transverse process extending throughout the cervical, thoracic, and lumbar regions. The ESP block is able to block the ventral ramus and provides a somatic analgesic effect. In the era of enhanced recovery after surgery, clinicians are encouraged to develop institutional programs to optimize patient care. We expect that as the number of studies on ESP increases, its use in acute pain management will accelerate. Hopkins PM. Does regional anaesthesia improve outcome? Br J Anaesth 2015;115 Suppl 2:ii26-33. Adhikary SD, Prasad A, Soleimani B, Chin KJ. Continuous erector spinae plane block as an effective analgesic option in anticoagulated patients after left ventricular assist device implantation: A case series. J Cardiothorac Vasc Anesth 2018. pii: S1053-0770(18)30257-X. Peng K, Ji FH, Liu HY, Wu SR. Ultrasound-guided transversus abdominis plane block for analgesia in laparoscopic cholecystectomy: A systematic review and meta-analysis. Med Princ Pract 2016;25:237-46. Støving K, Rothe C, Rosenstock CV, Aasvang EK, Lundstrøm LH, Lange KH, et al. Cutaneous sensory block area, muscle-relaxing effect, and block duration of the transversus abdominis plane block: A randomized, blinded, and placebo-controlled study in healthy volunteers. Reg Anesth Pain Med 2015;40:355-62.